A few years ago I featured on this blog what would become one of my go-to spring scents, Cartier Baiser Vole (Stolen Kiss). Cartier has recently launched a new flanker, Baiser Fou (Crazy Kiss). This scent was inspired by lipstick kisses (how sweet!) and was also created by perfumer Mathilde Laurent. Cartier Baiser Fou is an ode to the orchid flower, along with the elusive smell of lipstick, created with white chocolate notes. This Baiser is a sweet, gourmand version. The Cartier Baiser Fou opening gave me lots of sugary berry notes and then summer fruit, like watermelon. The fruitness leveled off after a few minutes and then a nice tarte/freshness came in, which kept it from being overly sweet and cloying. After an hour, I began to pick up the heart of the scent, which was a blended floral/rose and a creamy, vanilla feel under that. The powdery notes were very subtle and modern (so I didn't have that "old-fashioned" feel), and I liked the dry down, which enhanced the green, fresh notes and a creamy, warm woody finish. As with the Cartier Baiser Vole, the bottle has a similar heavy oval glass shape - but it's own glamorous jewel-inspired details, (this is from famed jeweler Cartier after all! ), and a light yellow color. 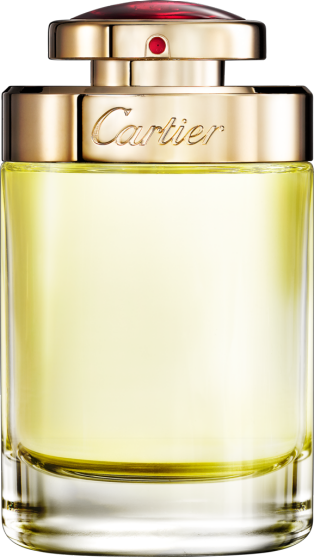 Cartier Baiser Fou is worthy of a prominent space on your vanity or fragrance table. Cartier Baiser Fou had above average wear (8+ hours) and average sillage* on my skin. *(from French) in perfumery - a veil of scent that a person leaves behind when walking or when you enter a room and smell that someone has been there before you. *This product was provided courtesy of Cartier PR for reviewing purposes.